This fresh water boat is in exceptional condition and has all the extras! Raytheon package including Radar, GPS, Chart Plotter and Depth Finder. She is powered by T-260hp 5.7L Mercruiser Bravo III's. There are only 689 hours on the engines. 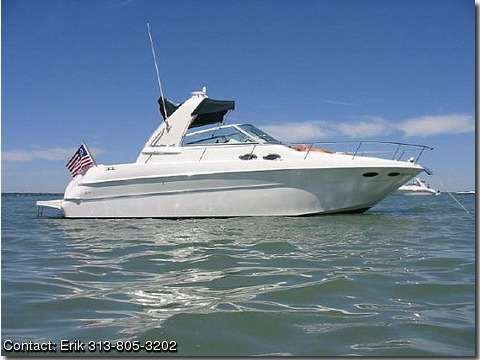 "Additional features include: VacFlush Head, TV w/VCR, AM/FM Stereo w/ 6CD Changer, VHF Radio, Air/Heat, Windlass, Trim Tabs, Remote Spot Light and 3 batteries" The cockpit area features a wet bar, snap-in carpet and u-shaped seating with table that also converts into a sun pad. The cabin features faux granite countertops, refrigerator, microwave, 2 burner stove, and snap in carpet runners. There is comfortable sleeping for six (v-berth, mid-stateroom and dinette all sleep 2). Call or e-mail for more info. yeehaa26@aol.com.